PEACHTREE CITY, Ga. — Sunbury Press has released Sharon Marchisello’s murder mystery novel Going Home, about a daughter’s quest to help her mother who is suffering from Alzeimer’s and is accused of murder. Michelle DePalma expected to jet into Two Wells, Texas, check on her elderly mother, and hurry back to her orderly life in Atlanta, where she has a happy marriage and satisfying career. Instead, she finds her mother, Lola Hanson, hovered over the bludgeoned body of her caregiver, Brittany Landers. Since the events of 9/11, one month earlier, Lola’s memory loss has amplified, and the family suspects Alzheimer’s. Now Lola can’t tell anyone what happened to Brittany. The agency that provides home care for Lola promptly withdraws its services. Michelle is stuck in her home town longer than planned as she cares for a mother with whom she has never been close and tries to prove her innocence. The police officers who investigate the crime are old antagonists from grade school. A secret thought to be long buried—that Michelle bore a son out of wedlock and gave him up for adoption—surfaces when a surprise daughter-in-law and granddaughter show up, distracting Michelle from her quest to solve the murder. And then she stumbles upon a motive which makes Lola look even more guilty. 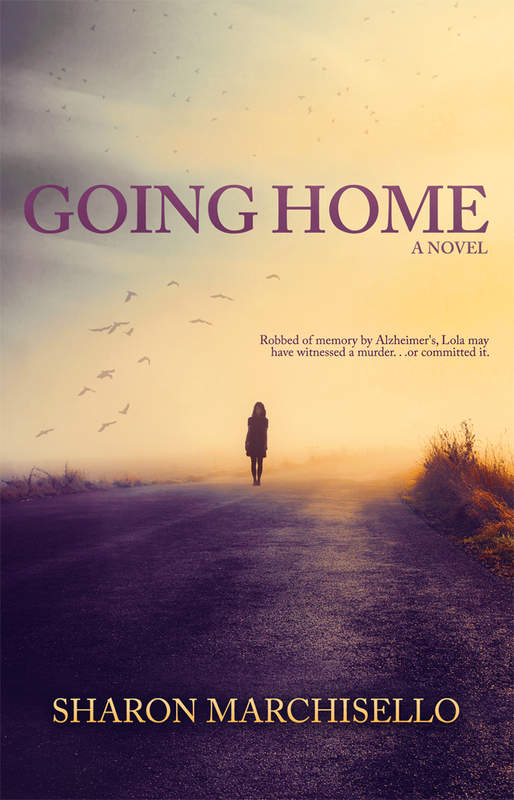 Going Home was inspired by the author’s mother’s battle with Alzheimer’s and explores the challenge of solving a murder mystery when a potential witness cannot rely on her memory. Written from the perspective of a baby boomer forced to reverse roles with her parents, it crosses into the mainstream genre of women’s fiction and touches increasingly common issues such as elder abuse and end-of-life decisions. I jumped out of my rental car and hurried up the walkway. This was my first visit in over a month—since before the awful events of September 11—and although I had spoken to my elderly mother over the phone several times a week, I was not sure what to expect. A smile illuminated my mother’s face as if someone had twisted a dimmer switch. “Michelle! It’s so nice to see you!” She took a step toward me, right through the puddle of blood. On the tile floor a young woman was sprawled, her blond hair caked with blood. I knelt at her side. No pulse. No breath. Blue-gray pallor. It had been years since I’d been proficient in CPR, and it wasn’t coming back to me. How many compressions? “Have you called 9-1-1?” My voice shook as I uttered those numbers. “What’s wrong with Brittany?” My mother squatted beside me as if we were playing a game. Mom’s blank stare confirmed she had not. Unlike most of my friends, I had no cell phone, so I dashed to the black wall phone in the kitchen. “What is your emergency?” The female voice was pleasant but businesslike, with an East Texas twang. “I couldn’t find one.” My own heart pounded. “Not yet. I called you first.” Had I made a fatal mistake? The woman politely cut off my blathering with brief instructions to refresh my memory and told me to start CPR. “Lord!” The voice of Karen Jackson, another of my mother’s caregivers, boomed from the entryway. “Don’t do this, Britt!” Karen was bent over Brittany’s body when I returned from making the call. Mouth wide open, eyes popping like peeled grapes, Karen looked up as I approached. I knelt beside her and began chest compressions as Karen tried to blow air into Brittany’s lungs. Sharon Marchisello is the author of The Ghost on Timber Way, part of a short story anthology featuring fellow Sisters in Crime members. She has published a personal finance e-book entitled Live Cheaply, Be Happy, Grow Wealthy, as well as numerous travel articles and corporate training manuals. Sharon grew up in Tyler, Texas, and earned her Bachelor of Arts from the University of Houston in French and English. She studied for a year in Tours, France, on a Rotary scholarship and then moved to Los Angeles to pursue her Masters in Professional Writing at the University of Southern California. Now she lives in Peachtree City, Georgia, with her husband and cat. Retired from a 27-year career with Delta Air Lines, she does volunteer work for the Fayette Humane Society.